You have to act fast in an emergency. Sometimes, that means taking the situation into your own hands. That's especially true if someone is shot or stabbed — it's probably better to drive them to the hospital yourself. Yes, really. In September 2017, a study found that trauma victims who take an ambulance are actually more likely to die from their injuries. I'm Shot! Call An Uber! For the study, Johns Hopkins University researcher Dr. Elliot Haut and his colleagues used data from the American College of Surgeons National Trauma Data Bank, the nation's largest registry of trauma data. They looked at information about more than 100,000 patients aged 16 or older who went to the emergency room for a gunshot or stab wound anytime from 2010 through 2012. The examples came from nearly 300 trauma centers across the nation. They found that of the gunshot victims who came to the E.R. via ambulance, 19.3 percent died of their injuries compared to only 4.5 percent who came in a private vehicle. 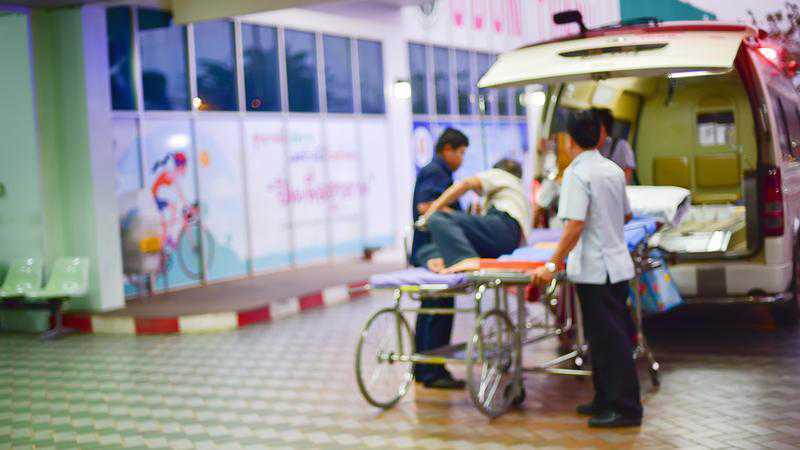 The same was true of stab victims: the ones arriving by ambulance suffered a 2.9 percent mortality rate as compared to only 0.2 percent by car. When the researchers adjusted for injury severity, they found that overall, patients with "penetrating injuries" like gunshot or stab wounds were a whopping 62 percent less likely to die when they took a private vehicle than when they took an ambulance. So maybe Lyft is better than catching a lift with the paramedics. How can this be? While emergency personnel are trained and have the equipment to deal with all sorts of medical emergencies, trauma is different. When you're bleeding, time is of the essence. You need to do whatever you can to get to the emergency room as quickly as possible. Previous research backs this up: when EMS workers take the time to immobilize the spines of patients with penetrating injuries by putting on a cervical collar and securing them to a board — something that's standard procedure in some parts of the U.S., not to mention most medical dramas — they increase the patients' chances of dying significantly, without much benefit. Dr. Haut, also an author on that study, concludes that "if someone is stabbed ... what we do for them and how fast we do it make a huge difference. That time difference in getting them to the hospital for treatment may make the difference between life and death." Despite the warnings about ambulances, if you or someone around you is shot or stabbed, you should call 911. "For certain types of injury, it might be best to call the police, Uber or a cab — however you can get to the trauma center fastest," Haut says. In the meantime, do what you can. If there's no head, neck, or spine injury, lay the person on their back with their legs elevated about a foot (30 cm) in the air. Don't attempt to remove any embedded objects from the wound. Finally, if you can, tie fabric around the injury to minimize blood loss. Then book it to the hospital like your life depends on it — because in this case, it does.